The Snapdragon 855 would be the first ever mobile platform to come with the X50 modem. 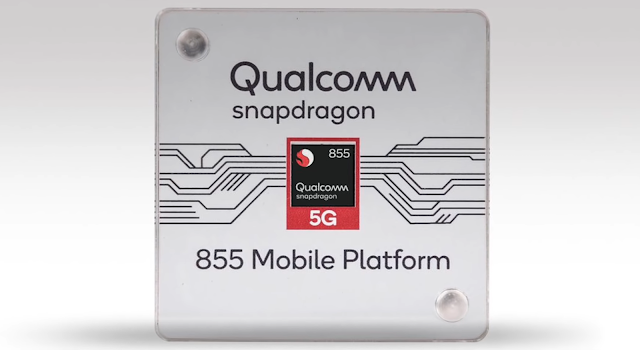 This will provide the device (which will carry the Snapdragon 855) the entry pass for the 5th generation of cellular network connectivity on their smartphones. Though their will be another variant of the processor which will be available with the X24 modem that'll be better than sd845's X21 and provide almost 2 Gbps speed but will not support 5G features. Many smartphone manufacturers have already announced that they will launch their 5G ready devices packed with Snapdragon 855 either in December'18 or in early 2019. The Snapdragon 855 will be the first ever processor from the brand that'll be made with 7nm manufacturing process. Unlike the previous ones, it will this time have an extraordinary "Prime core" for high performance which will be clocked at 2.84 GHz. 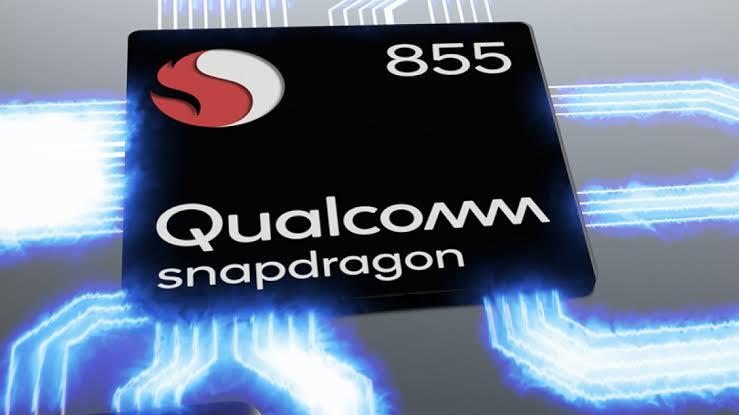 Along with it the Snapdragon 855 will have 3 performance cores clocked at 2.42 GHz and 4 efficient cores which will have lower clock speeds of 1.8 GHz for lower energy consumption. All of the above will be Kryo 485 cores based on ARM Cortex A-55 (4x low power cores) and A-76 (rest of the three high power cores and the Prime core). 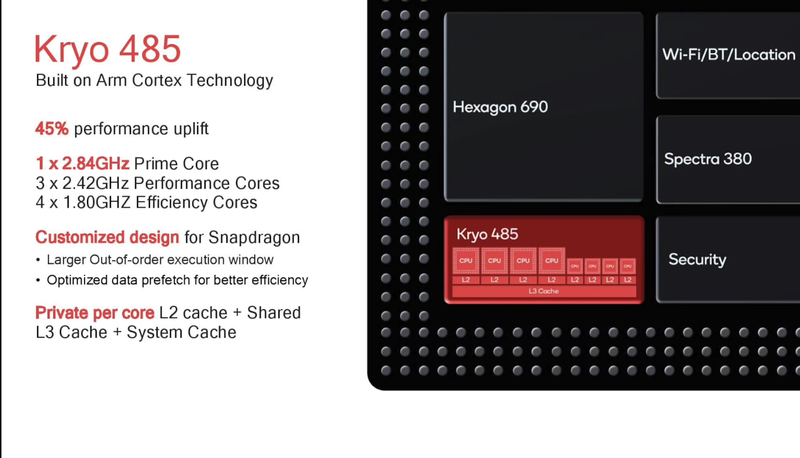 This will give the processor a performance boost of 45% than its predecessor. Qualcomm has introduced its latest and most powerful GPU with the few flagship chipset. It is named as Adreno 640 and it is packed this time with HDR gaming support for the first time in mobile gaming. It's an upgrade to the predecessor Adreno 630 and will give a 20% boost in graphics than the previous one. 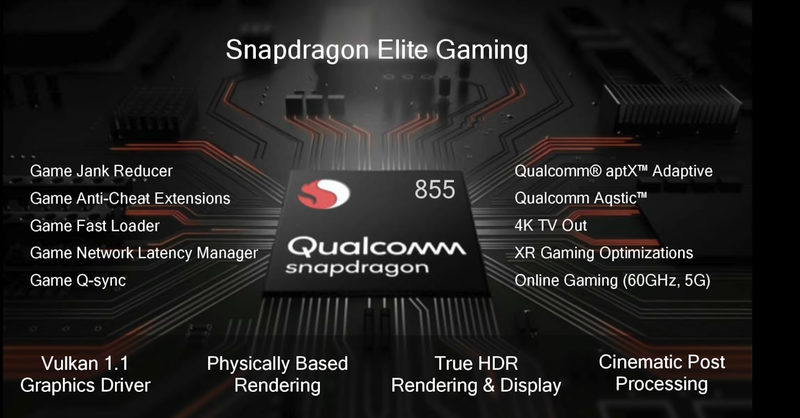 Snapdragon has introduced the "Elite Gaming" here with the latest flagship chipset, that is the Snapdragon 855. It claims that the chipset will carry great visual effects and awesome sound experience with the new processor. 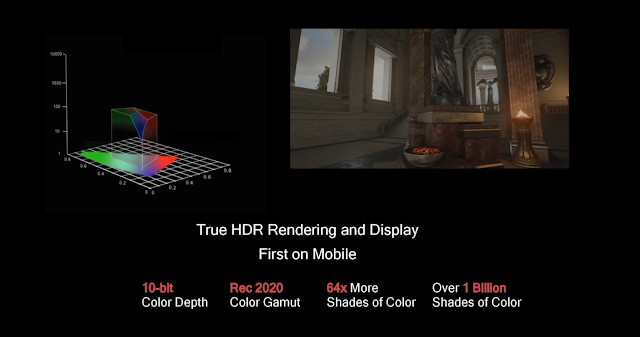 With the 10 bit colour depth, users can experience 1 billion colour shades while gaming with a Snapdragon 855 powered smartphone. Also the Vulkan 1.1 support will reduce the battery consumption by 20%. AI has been the most immersive feature of smartphones in 2018. Even the mid range processors are nowadays concentrating on AI enhancement. Also the software section is demanding that feature after Google launched its Android Pie, which was packed with too much AI functionalities. So here also Qualcomm has worked quite well and taken the AI enhancement to the nexter level by introducing 4th generation multi core AI engine with the new Snapdragon 855. It promises to complete 7 trillion AI tasks per second. All thanks to the Hexagon 690 used by Qualcomm. 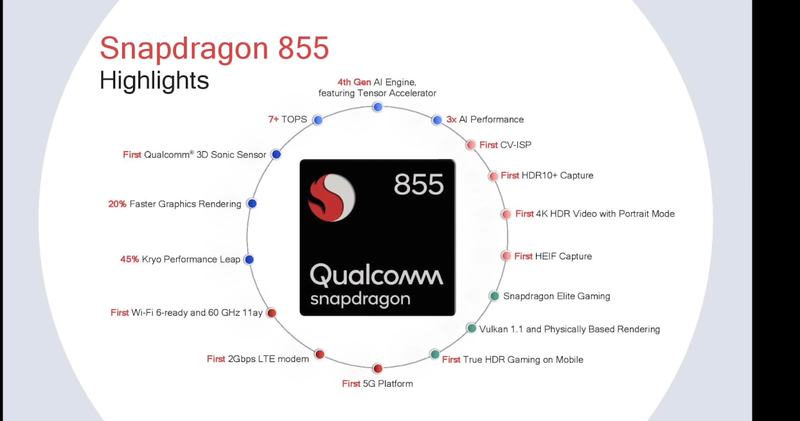 With this, the Snapdragon 855 will be 3 times better than its predecessor and almost 2 times better than the competetion available in the market. In the camera section, Qualcomm also has introduced new improvements than its predecessor and brought the perfect successor to the sd845. We saw Sony launching world's first 48 MP smartphone camera sensor back in July, 18. 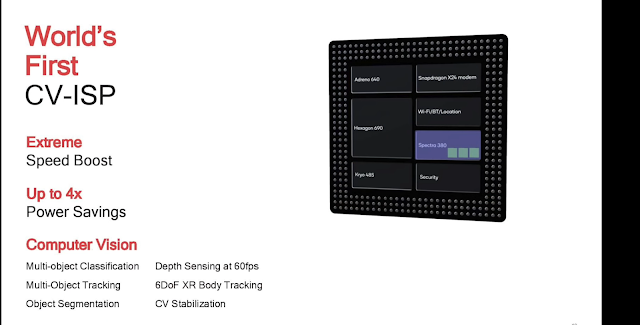 Now Qualcomm has announced that the Snapdragon 855 will support a maximum of 48 MP (single, dual - 22 MP) sensor in it. It has the latest Spectra 380 Computer Vision Image Signal Processor (CV-ISP) for the first time in mobile cameras that will take the experience of mobile photography to the next level with the help of AI. This will bring the portrait mode in videography for the first time in smartphones also with the HDR10 video recording support. This definitely is going to change the mobile photography experience forever. Physical fingerprint sensors have been the history. The new optical Fingerprint scanners are being used nowadays by many brands under the display. 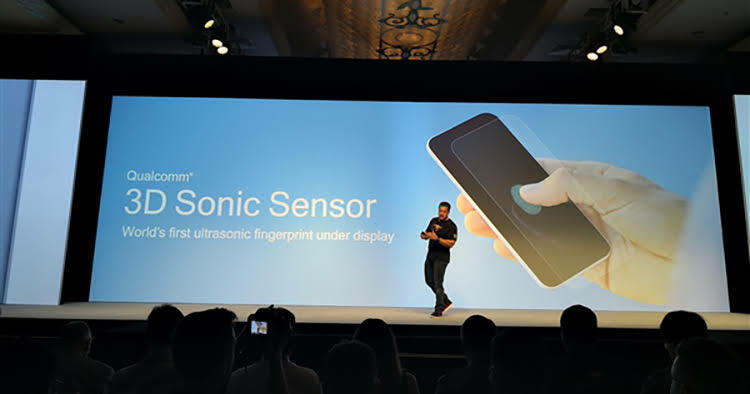 But Qualcomm has brought the most innovative way to unlock your phone, the 3D Sonic sensor for fingerprint reading. In the under display optical fingerprint sensors, the sensor was actually capturing a 2D image of the finger by the light's reflection. But the 3D Sonic sensor will throw sound waves to the finger and capture a 3D image of the finger. That will make it more secure technology in terms of security. And by placing the finger in any portion of the screen, the users can unlock their smartphone unlike the optical sensor where the user has to maintain the spot where the sensor is placed. Now this is called real innovation and this will soon overtake the optical sensor though this would be more costlier. This was the features of the Snapdragon 855 chipset. But the 5G compatibility will be restricted to only few of the processors as all the Snapdragon 855 chipset will not have the X50 modem. Qualcomm will deliver according to the smartphone manufacturers demand. So if you are going to buy a device having Snapdragon 855 under the hood, don't be sure that it'll have the 5G in it by just seeing the processor name. You also have to check the details completely. And also after buying the 5G version of the smartphone users have to wait till the end of 2019 or the starting of 2020 to run 5G smoothly in India.